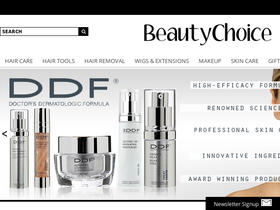 BeautyChoice.com is one of the leading online retailers for premium beauty products. Beauty Choice is committed to providing top tier products at the highest quality and authenticity. This site offers not only products for women, but products for men also. Their inventory includes products in hair care, hair tools, wigs & extensions, makeup, skin, fragrances, and accessories. Beauty Choice provides their customers with the hottest brands in beauty such as Allure, BCBGeneration, Clinique, Conair, Brazilian Blowout, Ed Hardy, Jessica Simpson, Raquel Welch, Revlon, and many many more. Check out RetailSteal.com today for the best Beauty Choice savings, Beauty Choice codes, and Beauty Choice codes. BeautyChoice.com provides shipping to the United States and internationally. Flat rate shipping applies to all destinations, depending only on your choice of shipping method. See website for details and exclusions that may apply. Use our coupon code at Beauty Choice today and save 20% on select curling systems. Use this coupon code online at BeautyChoice.com and save 5% off your purchase. Click link to shop. Get 25% off the GMJ 3D Vibrating Flat Iron using this coupon code online at BeautyChoice.com. Click link to shop. Use this coupon code at Beauty Choice today to receive a 20% discount on your purchase of any BH Cosmetics. Use this coupon code on Beauty Choice to save 5% on your order. Enjoy 10% off Raquel Welch wig at BeautyChoice.com - use coupon code to shop and save. Save $20 on the Farenheit Professional 4 in 1 Ceramic Clipless Curling Iron Set using this coupon code online at Beauty Choice. Click link to shop. Use the coupon code and save $5 on Ozon Flat Irons online at Beauty Choice. Click link for savings. Act now and save up to 70% on cosmetics and hair accessories when you purchase from BeautyChoice.com. Click the link to start saving. Save up to 40% on FHI Go Styling Irons at BeautyChoice.com. Click here to shop and save for a limited time. Act now and receive savings of up to 20% on select skin care brushes at BeautyChoice.com. Shop at sallybeauty.com and get a free cosmetic item when you purchase 2. Shop online at sallybeauty.com and save $5 on your order of $25 or more when signing up for the email newsletter.